One of moderate interest only I think. 'Aap Ko Pahle Bhi' has some cool Hindi/rock'n'roll mash-up bits, 'Chheenk Meri Jan' has sneezes and a nice syncopated rhythm, but that's about it for me. 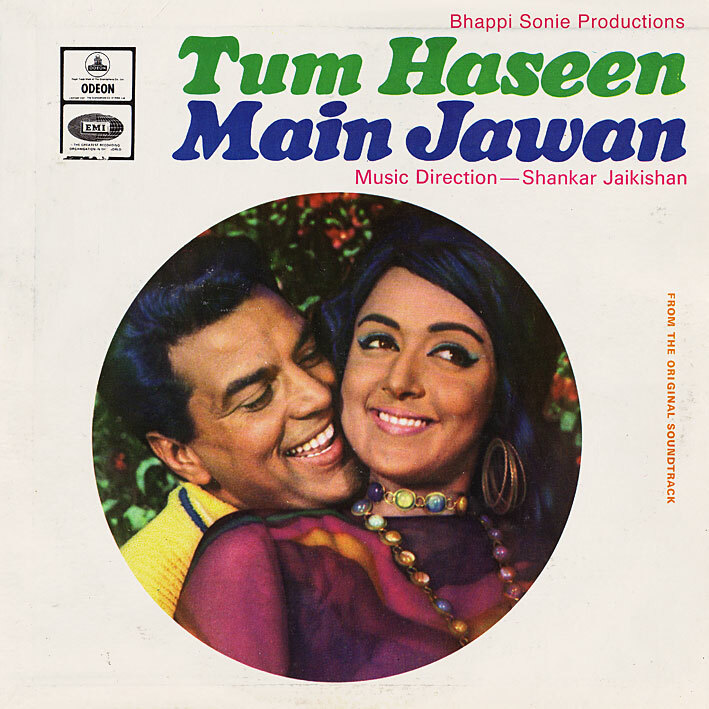 I can't recall when Shankar Jaikishan called it a day, but I suspect 'Tum Haseen Main Jawan' [review] was made just past their prime... I'm not aware of very many good scores by them from the 70s or beyond. I'm already grooving on 'Aap Ko Pahle Bhi' ... I think it's better than you're giving it credit for! Cool :-) I don't think it's bad at all, I just like many of their other ones better. Awesome awesome awesome !!!!!!! Thanks a lot ! One of the greatest Hema Malini and Dharmendra movie with songs even greater. Great composition by Shankar Jaikishan ! Thanks for THMJ, much appreciated !!!. such a fun film, thanks for this!!!!! and actually "Cheenk Meri Jaan" would make it to a post on songs picturized on Miss Helen. She is very cute, sneezing all over the club patrons! I'm addicted now to your blog. Just to add to my earlier post, when I said S-J's music was pretty much "over" when Jai passed away, I meant even though Shankar produced great music on his own after, it wasn't the same as before. Hey Do you ahve Hariyali Aur Rasta ? big ups to this website, I am finding here a lot of great composed music most of the time. This snippet here is showcasing how Timbaland sampled - again - indian music. What are the artist and names of the two indian tracks? ?